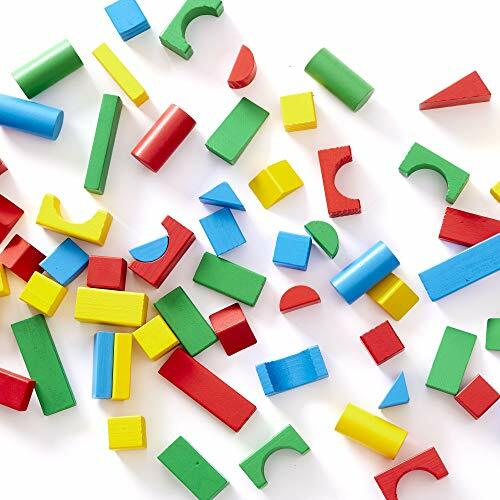 This classic wood block set includes 100 solid-wood blocks painted bright red, blue, yellow, and green. A versatile variety of shapes are included: rectangular prisms, cubes, cylinders, half circles, arches, and two different sizes of rectangular planks and triangles. 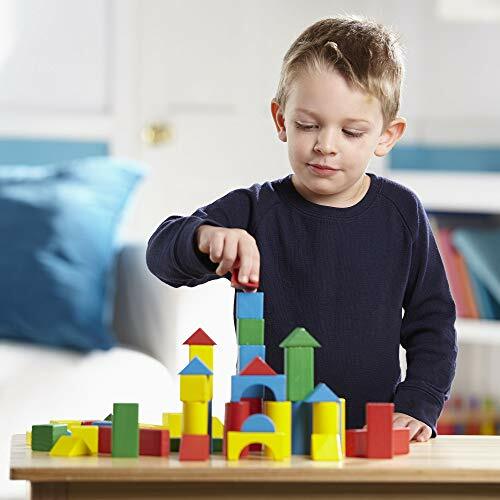 A set of wooden blocks provides an opportunity for a child to pass the hours constructing towers, castles, towns, and more! Designed for children ages 3 and up, this set offers the opportunity for younger kids to practice their fine motor skills and experiment with the laws of physics while giving older kids an outlet for their creativity. Parents will appreciate the safe, durable construction. Though they're made of solid wood, these blocks are light in weight, which makes them safer for small children. The blocks have rounded edges and a smooth painted finish that won't splinter with play. Our wooden building blocks set is designed for kids entertainment but also introduces early math concepts, and helps children develop good patience and strong motor skills. The Melissa & Doug Wooden Building Blocks Set makes a great gift for kids aged 3 to 8 years. Add the Melissa & Doug Wooden Latches Board to round out the hands-on play experience. For more than 30 years, Melissa & Doug has created beautifully designed imagination- and creativity-sparking products that NBC News called “the gold standard in early childhood play.” We design every toy to the highest-quality standards, and to nurture minds and hearts. If your child is not inspired, give us a call and we'll make it right. Our phone number is on every product!